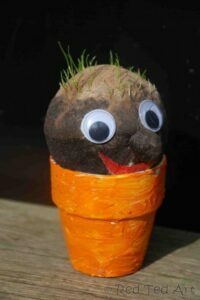 Welcome back to Kids Get Crafty – this week we have our very special How to Make Grass Heads – Bill & Ben the Flowerpot men…. we made the grass heads about 3 weeks ago now.. and have been watching the hair grow and chop chop chopping it and trim trim trimming it off. 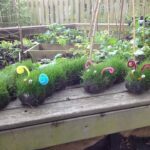 This is a fantasic Make & Grow Garden Craft for Preschool, KS1 and KS2. Red Ted LOVES them! He was a bit skeptical at first (he saw my old tights in dismay), but soon was rather pleased with out DIY Grass Head creations. 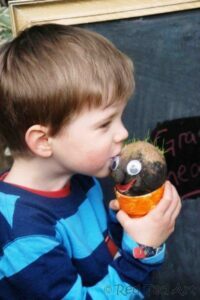 Learn how to make grass heads today and create your own Mr Grass Head Dolls! 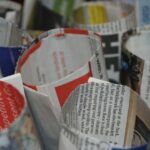 They are a perfect STEAM craft for Spring, but you can make throughout Spring and Summer – maybe a nice project to help keep Summer boredom at bay? 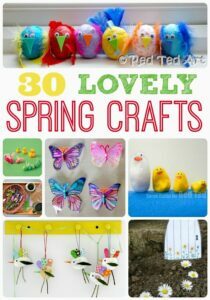 They also make great Spring or Easter Party Bag gifts! Also… we have since got a post on some fabulous Grass Caterpillars. They are so so so fun! Similarly you may also enjoy these cute Wellie Planters!! 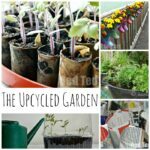 A fun way to upcycle much loved old wellies! 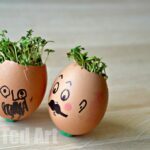 Note: these easy grass heads were first shared in April 2012, I have updated the post and reshared it for your convenience! Either watch the Grass Head Video How.. or check out the step by step photos! As mentioned, not only do these make a fabulous STEAM Spring Activity for Keystage 1 and Keystage 2 (or at home of course!! ), but they are also fabulously thrifty and inexpensive to make. 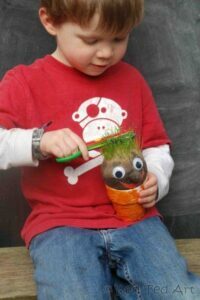 The kids will ove to make these Mr Grassheads and watch them grow! A pot for your grass head to sit in! 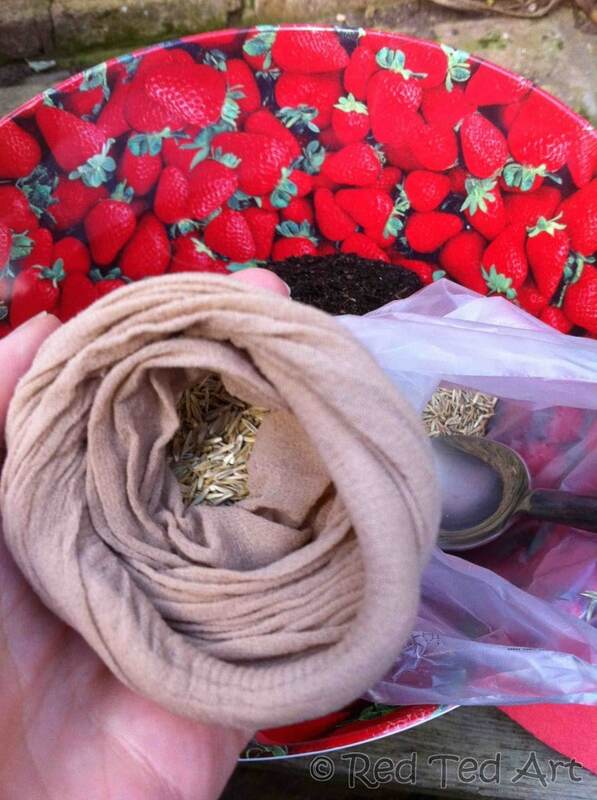 1) Put 2-3 generous table spoons full of grass seeds at the bottom of your tights. I held the tights open. Red Ted scooped! Pip Squeak ran off with one of the tights and wasn’t to be seen again. She had her own world play time with them! 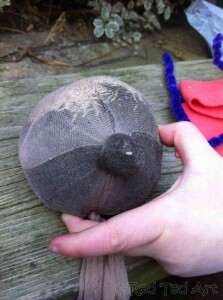 3) Pinch a “nose”, twist it and wrap and tie in place with cotton. This was quite fiddly, but we got there in the end. 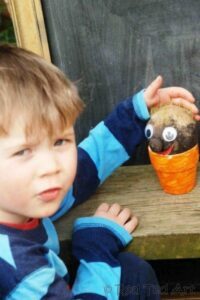 4) Glue on googly eyes and mouth with PVA. 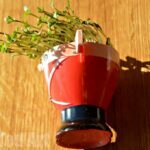 5) Place in a yoghurt pot or similar – we had a paintedflower pot (with no holes). 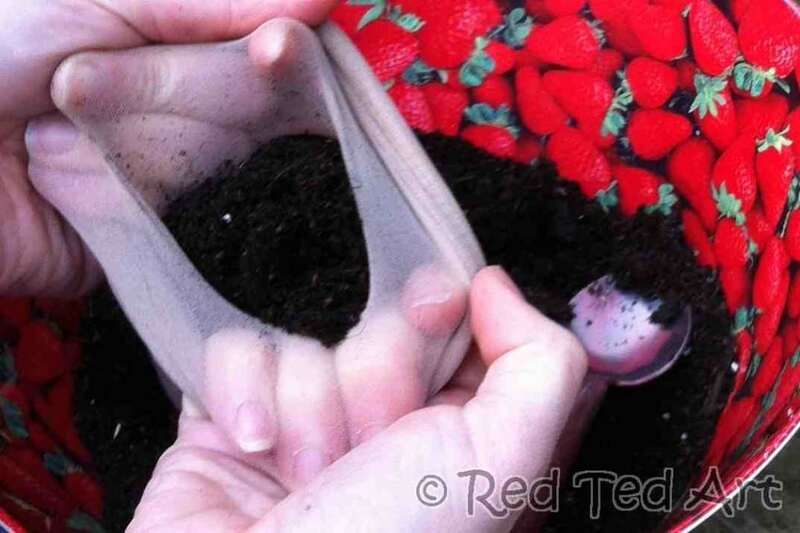 Add water and the tights will “soak the water up” into the earth. If you want to speed it up, you can give the head a quick shower under the tap to moisten the earth the first time round. After that take care not make it too wet. Place in a sunny spot! 6) Wait for hair to grow. 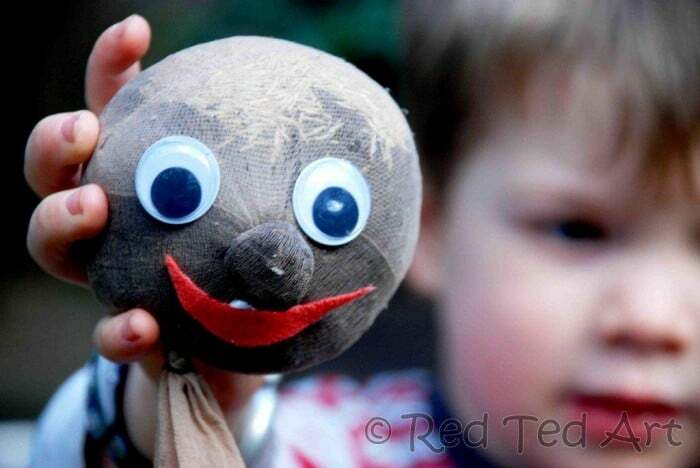 Make sure you don’t keep the head too wet – we did at first, which meant that the mouth fell off and that the googly of didn’t dry properly for ages. It also means your grass head can get mouldy. So your head should feel moist but not soggy. Basically just add a little water to the pot every so often. 7) Cut your hair. Again and again! I reckon the Grass Seed Heads are a success! Let’s see how long we manage to keep that hair growing! 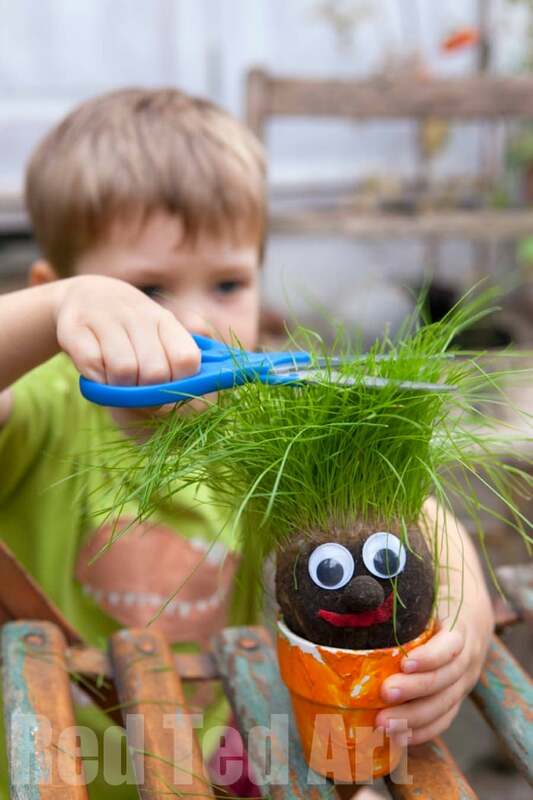 Hope you have a got making your own Mr Grass Head DIY! 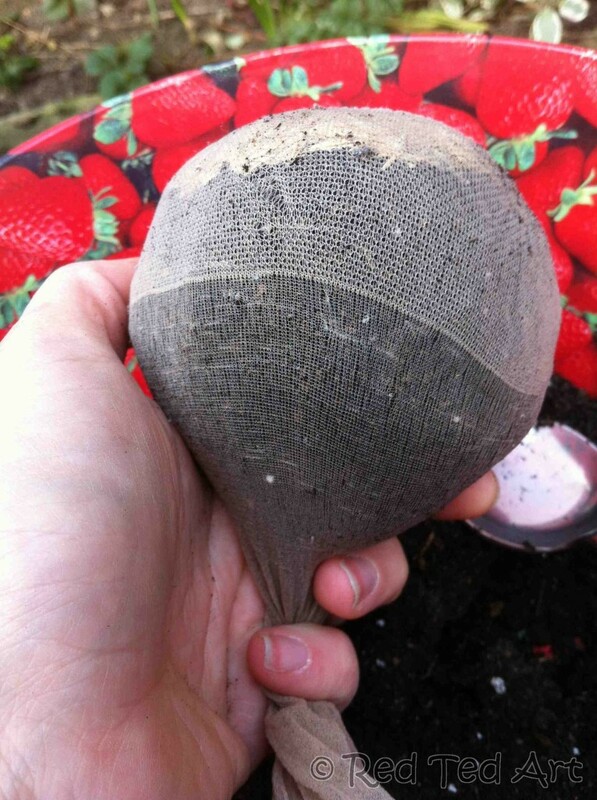 How to… make seedling pots! You always have the cutest ideas! 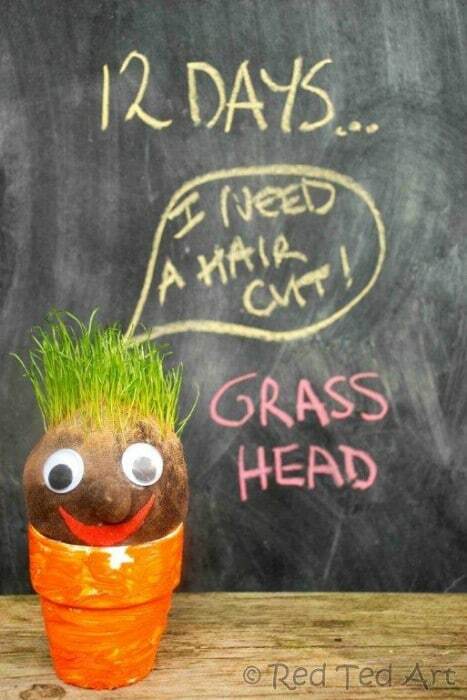 Love the Grass Heads! They look so much fun and really cute. 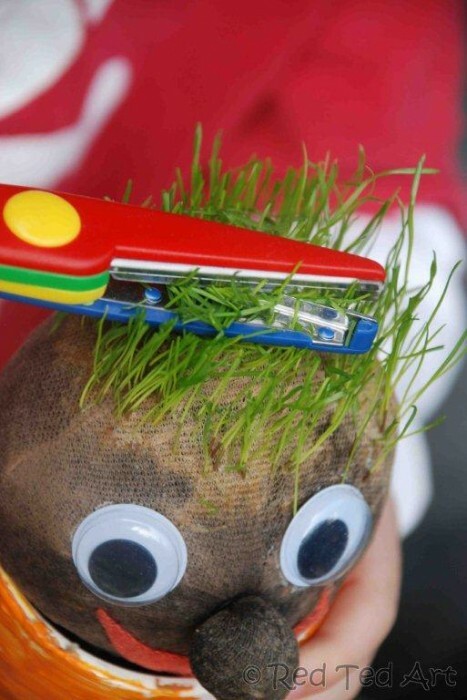 I always loved grass heads! That\’s fun for kids and adults. Thank you! 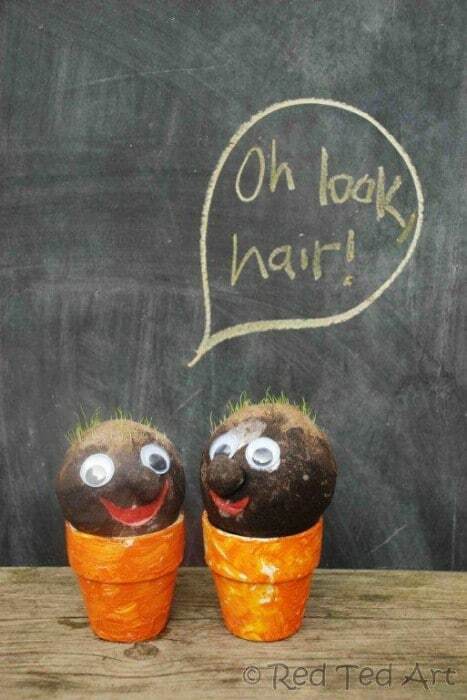 Grass Heads really DO make us HAPPY! I think we will be making them every year now – especially as Pip Squeak *finally* decided to give hers a hair cut today! Hooray for growing things and cutting hair. 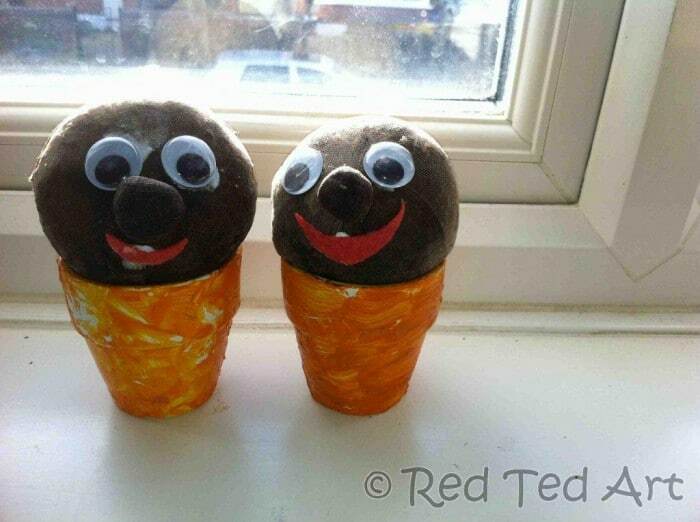 What a great idea – we don\’t use a lot of eggs so these would be a great way to do this instead :D.
It always makes me grin when a child says I \”NEED to make\” something. SOOOOO cute!! 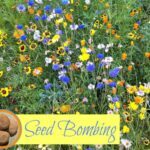 If you have grass seeds at home… maybe you can? I had to ask a neighbour for some! @Tasha googly eyes totally make everything soooo fab! Oh, I have to do this with my kids! They\’re great! 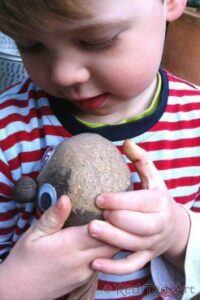 Maggy – the noses on these crack me up! I can\’t wait to do this with the kids. Thanks for the inspiration! @Emma – isn\’t it amazing how fast it all grows?! @Krissy -hooray! hope you have lots of fun! I am ashamed to say I have been looking out for grassheads for some time now. Thought they\’d be cheaper than a new pair of tights! But after seeing this I am determined to get some ladders in my tights and thus not feel like I\’m wasting a perfectly good pair! P.S. I have lots of brightly coloured tights (left over from numerous fancy dress outfits at uni…but I still wear them on gloomy days!) – how about hairy monsters? Think I have green, red, purple and yellow. May be best with sawdust tho to show the colours best. Oh yes, I so know what you mean. I was almosted delighted when I spotted a ladder!! 🙂 And yes yes yes!! Use the brightly coloured tights. I don\’t think you would notice the colour that much and if you don\’t really need them that much anymore…? They are beautiful! What a great idea. Nice pictures too! I love your grass head men!!! The grass head photoshoots are too funny!! Love the grass heads. What a fabulous idea. Oh my these are so lovely and I really like your photos Maggy. Well done! Your photos are so hilarious and awesome! I love the chalkboard photos as if he were a child! Amazing! Just yesterday I almost paid money to buy something like this at Lowe\’s. So glad I didn\’t as this would be much more fun to do as a family!! Oooh so pleased you didn’t buy them and that you will have a go! That is so insanely cute and fun! I am off to dig out some old tights today! way cute… we may have to start these this week while on spring break! Oh yes, please do make some! Perfect for Spring break! GREAT project and great photos which means you\’ve earned yourself a feature! thanks so much for sharing on craft schooling Sunday! Great post! Love the chalkboard in the background. An oldie but a goodie. Thanks for linking up to the Kids Co-op! thanks for sharing this fun idea on the sunday showcase. I haven\’t begun any gardening yet but I know the girls would love this – trimming the hair would be a sure hit around here! I am featuring this as one our fave links of the week! Oooh thanks for featuring @Bernadette!!! 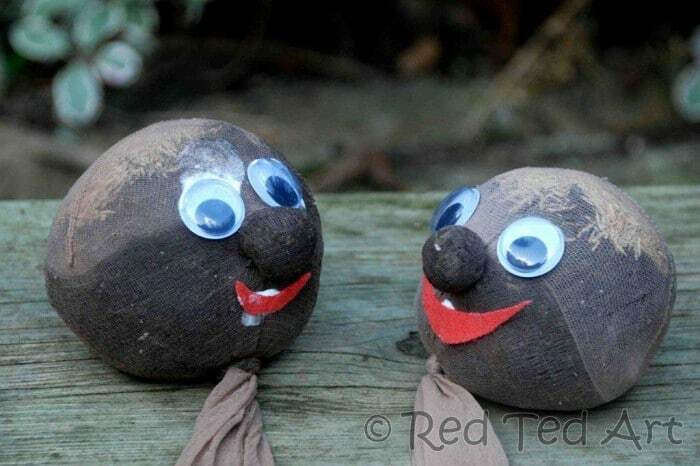 The Grass Heads are definitely a great way to get you started in the garden! So much fun and so easy! So happy to see your grass head guys at our Outdoor Play Party! I will be sharing this on my FB Page, The Golden Gleam. Aaah thank you! And thank you for hosting! Oh how lovely! Thank you so much! Oooh thanks for reminding me of this activity… think we might make some over the school holidays. what a fun idea, can’t wait to try this with my kids! 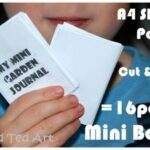 These are fantastic, such a great way to get children interested in how things grow and how to care for plants. Love and adore specifically the speech clouds! I love the ideas on this site! 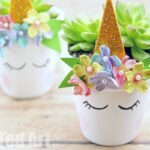 I was wondering, I am doing craft fairs this summer and I wanted to make sure before I took any ideas from here if I could use some of these ideas to make craft kits for the kids? I would be selling them so please let me know as soon as possible. The money I would be asking for them would just cover the supplies pretty much, but the fun it would give the children would be priceless! If possible could you send me a private email so I don’t miss the message? Thank you and have a great day! i got curious as to how long Red Ted kept it alive. Ooh I think we had ours 4-6 weeks? I think you can keep it much longer than that… but we went on holiday and the neighbour forgot to water it! Super fun! I love the nose and bright red smile! Thank you! He is a happy chappy, isn’t it?! I remember these from my child days! Need to do it with my kids, it is adorable! So cute. We will use catnip. Yes! Was thinking of using catnip next!!! So good idea for a weekend project! My girlie will definitely love the grass heads. She likes helping with the planting in our garden, the whole process is very interesting for her. 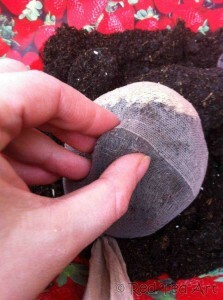 This spring she took part in the vegetable seed starters preparing and was so proud of herself. Making these grass heads will be a new and interesting experience for her. Thanks for the idea! How big of a pot should I order? We want to make this next week in my classroom. Thanks! The little pots we used where only about 10cm high I think… but you can use a decorated yoghurt pot or a glass jar or tin can too! Wow.. !!! that is so great. I’ll try this from your method. Hi! Thanks for the idea! Can anyone tell me how often it needs to be watered? I feel like it’s moist so leave it alone but my son is arguing to water it. Help? Lol…thanks! I always make sure that there is water in the pot UNDERNEATH – the tail end of the head will “self feed” and there should always be enough water.. check the “pot” every 2-3 days! Hope that helps!